This past weekend the Carrack in Durham held its second annual Red Dot Fundraiser. I’ve mentioned the gallery before. In my opinion, it is the single most generous and awesome venue to exhibit in the Bull City. The Carrack is a zero commission gallery, which means that when an artist sells their work they receive 100% of the sales price. Most other galleries take anywhere from 30-50% of the sales price as their fee. To be able to operate, the Carrack takes donations from sustainers and hosts events like this one where local artists donate work and the proceeds benefit the gallery. As someone who is just starting out, I like being able to contribute by donating art since I don’t have a lot of extra cash. For the fundraiser, the Carrack asked for small works no bigger than 11×17. Then the work was placed into three categories and price points based on size. The smallest works were one dot or $25. The medium works were two dots or $50 and the largest ones were three dots or $75. The piece I donated was actually completed a few months ago. It’s titled It’s Over California, measures 10×10 and is acrylic on birch. This painting is similar to a lot of the mountain paintings I have done in the past where I divide the space with horizontal bars. 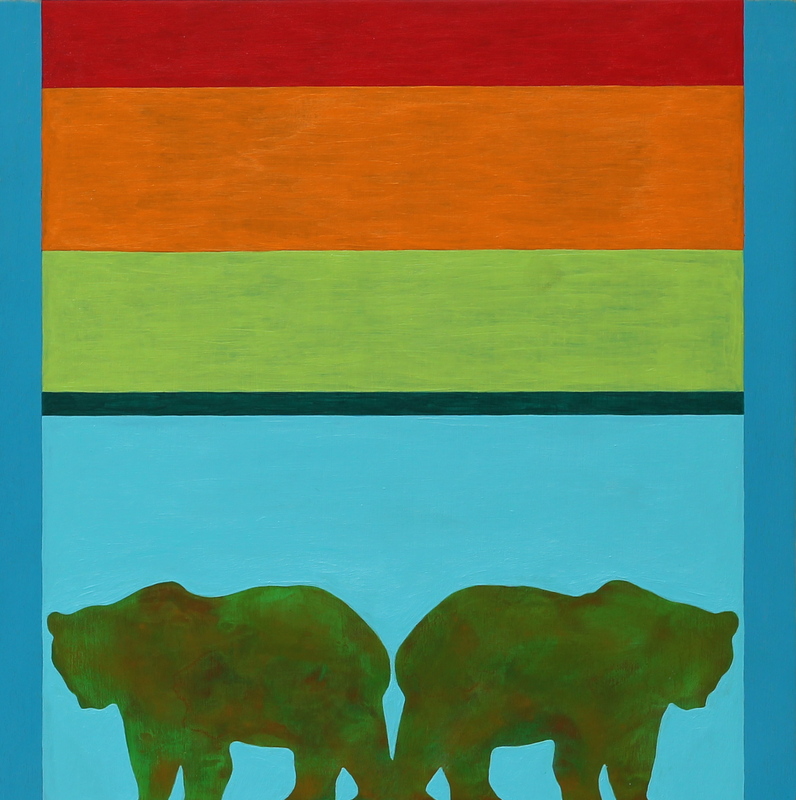 At the bottom, there are two bears, which reference the California flag, walking away from each other. I was born in Virginia and have spent the majority of my life there, only recently moving to North Carolina. Since I was a kid, I have always dreamed about living in California. The first time I remember thinking it was a cool place was when I heard how the hippies descended on San Francisco. Music and art have always been synonymous for me and the gig posters from the 60’s with their trippy imagery and drippy text blew my mind. The skate culture and related artwork that I’ve always loved originated in California. And as I became more aware of contemporary artists that I liked, most of them had studios and shows out there. So my whole life, a small part of me has always wanted to be a part of that. When my work doesn’t get the positive feedback I want to hear, I can’t help but wonder if it would be received differently out there. And that’s what this painting is about – that internal conversation. But, as the title and imagery suggests, the dream is over. Even though a lot of times I think I could fit into that world a little easier, its not gonna happen and I am ok with that. Whether I make a career out of painting or not, I’m going to live my life in the south. I just have to find the right place to share my work where it is not so out of place.